I'm in the process of proofing Rebirth of the Gangster Act 2: What's Old is New. It's always exciting to be soon releasing a new graphic novel, but an author's ego always takes a little hit when proofing. To keep my spirits up (and tease the new graphic novel), I thought I'd post the cover of Act 2. Enjoy! The drive north was one of the longest trips Rodney had ever been on, but--to him--it did not drag on like it did for the rest of his family. Rodney, his two brothers, and his parents were on a trip to a farm owned by Rodney’s grandfather. Rodney had heard snippets of conversation about this farm before, even though those conversations happened while Rodney was daydreaming as usual. He vaguely recalled descriptions of cows, pigs, and (unusual to his mind) a go-cart. However, he shrugged these peripheral noises off and kept watching TV. He could have heard more, but cartoons called his name. Now, here Rodney was, on his family’s first trip to the farm. So far the trip had been great. In the fuschia minivan, a fixture of all families, he sat next to a pile of comics, picking them up and tossing them aside as he finished each issue. The surroundings switched from city to country: skyscrapers and colossal cathedrals gave way to identical blocks of houses; this suburban style gradually disappeared to make way for rolling hills, wide expanses of land, tumbling rivers, and a few old houses scattered every few miles like anthills in a field. These surroundings slipped by unnoticed by Rodney though. Instead, his attention remained riveted to stories of superheroic strength, magical monsters, and criminal capers. Colors cascaded outside the car, but the dynamic dyes of pulpish paper were the only colors Rodney cared for. His brothers argued, played road trip games, and argued again. Rodney ignored these outbursts, though, as if he were permanently in the eye of the storm--isolated from the whirling forces outside. His mom and dad struggled through their favorite songs, belting out choruses and mumbling verses. Before he knew it--he was knee-deep in Spider-Man’s Clone Saga--their van slowed down and turned onto a dirt path. It rumbled along the path, tires crunching the dirt beneath them and wobbling the van from side-to-side. For the first time that trip, Rodney set down his comic without picking a new one up: he was finally looking outside at the world around him. For those of you who don't know, to pay the bills (and my artist Juan Romera), I teach high school English. Needless to say, I've been pretty busy. But to honor the new school year and a new class of students taking my graphic novel class, I thought I'd rerun an old blog post that I wrote after my first semester teaching that class. Enjoy! As a life-long comics fan, I’ve always tried to remove the blinders from people’s eyes and make them see the value of comics, to open the doors that prevented them from entering into this new and wonderful world. In grade school, I strong-armed my friends into taking trips to the comics store with me. In middle school, I took a brief detour and closed the doors on comics–finding yourself and accepting yourself in middle school is hard enough without having to embrace the label of “Comic Geek,” especially since most people’s frame of reference for comic fans at the time was The Simpson’s Comic Book Guy. Eventually, in high school, I grew tired of having this secret identity and would proudly proclaim my love of comics, shoving comics into the hands of friends based on interest. A friend liked the action, intrigue and conspiracies of the Bourne books–check out 100 Bullets. A friend already liked Neil Gaiman’s prose work–check out Sandman. A friend and I connected over our shared love of the 90s X-Men cartoon series–check out this other cool X-Men thing from the 90s called Age of Apocalypse. The doors were starting to open again, but I had more than a few friends who slammed it shut in my face. Now that I’m a high school English teacher, I still want to open the doors so more people can enjoy the great world of comics, but I have some different methods. At first, it started off as offering Maus as an alternative to another concentration camp book, Night. Then, it branched into having students use online comic creator programs like Pixton to showcase knowledge of theme in a text we read. But these only opened a few doors for the few students in my class who wanted to explore new rooms. It was time to try something else. Three years ago, I decided that it was time to propose a graphic novel class. I’d had a taste of the engagement that comics can build in students, and I wanted more, but I wanted to see this happen every day for every student in a class. I spent a frenetic weekend poring over my district’s new course proposal requirements, filling out the documents, asking for feedback from other teachers who had proposed a class before, and then revising those documents based on their feedback. I might have been dead to the outside world, but I was creating a new world for a new classroom. Unfortunately, for various reasons having to do with district politics, all of our English department proposals were rejected, graphic novel included. I’d glimpsed some light through a crack in the door, but just when I was about to cross the threshold, the door was slammed in my face. Again. Two years ago, I made slight changes and then sent it to be approved. But our district had changed the course proposal requirements, allowing only one department to add new classes per year, and it was again rejected, because it wasn’t our department’s turn. The door remained closed. Finally, a year ago, they opened the door (not just to my class, but to our department’s eight other new classes). I spent that year ironing out any kinks any the course, and so that I could speak more to the creative process of making a comic, I started self-publishing my thriller comic Rebirth of the Gangster (shameless plug–it’s on sale on Amazon, and it’s like Breaking Bad meets The Wire with a shot of Shakespearean drama and debt to Othello). The year passed, I’d adjusted some of the choice texts for the class, and I’d released the first three issues of my series, and I entered my classroom doors at the beginning of September, ready to unlock student’s passion for comics. But that didn’t pan out quite like I hoped. Sure, there were students who had read plenty of comics (especially manga, often from students who were in the anime club I advise). And those students entered my class with the same curiosity and commitment I would’ve entered a similar class if it had existed when I went to high school. They saw something worthwhile in every comic we read, even the more abstract Understanding Comics that tripped up many other students. They poured sweat into every Behind the Scenes activity we did, even if they only cared about the writing part of the comic creating process or if they only cared about the penciling, inking, coloring, or lettering we focused on in other BTS lessons. They would often offer insights in class discussion that I hadn’t thought of, prompting other students to become more engaged in the stories we read. And when the end of the semester came, and they had to create some aspect of a 6-page comic, they worked for their own growth, not for a grade. They created something that not only earned an A; it earned my gratitude and pride. These students saw an open door and jumped through it, never looking back. But these students only counted for about ¼ of my class. The rest of my class didn’t care about comics, and even more worrisome, didn’t care to put in work when asked. They took my class because they thought it would be an easy A. “It’d be less work, and even if I have to read, reading comics is easier” is what they all told me. Comics might have become legitimate enough to have a class all their own, but people’s perceptions weren’t changed that quickly, and comics still weren’t seen as legitimate or as deep as other media. At least they were honest. Sometimes this didn’t matter. My students who had opened the door and started exploring every nook and cranny of these new rooms would often carry discussion, pulling some of these students in. And even when they didn’t pull other students in, talking with those students about comics–learning from them as they were learning from me–often made my day. But on those days when they didn’t carry conversations, class would drag, and it would weigh on me more than any of my other classes. I began to dread this class. And I think my students could tell, but they didn’t change. In fact, many students got even lazier. It got to the point that one of my students lost their job, because his parents wouldn’t let him work when he was failing my class. I’ve taught for seven years, and that was a first for me. This student even admitted he only failed because he didn’t care enough about the class to try, but his behavior didn’t change. He closed the door, and even when he was standing in a hallway on fire, he refused to open it. I got so sick of this that I had an extensive heart-to-heart with my class. I talked about how I had more Fs in that class than the rest of my classes combined. I talked about how comics were my greatest passion, but that this class’s attitude was making me dislike my greatest passion. I talked about how something similar had happened when I taught a hip hop class, and that I needed to take a break from teaching that class because of the lack of passion from my students, not because I didn’t love hip hop. And I told them that unless things changed, the same thing was going to happen here: I’d teach this course for a year and then abandon it in the same way I felt that most of my students had abandoned my jewel, the class I had worked harder on than the AP classes I teach. I don’t know if it was this talk, or if it was just that many of my students put in a last-ditch effort to avoid an F for the semester in this class. Whatever it was, over the last two months of this class, I began to see more effort and curiosity from my students. Part of this could have to do with reading a choice graphic novel in the last part of the semester: as much as I love Kuper’s Metamorphosis, Spiegelman’s Maus, and Satrapi’s Persepolis, I definitely know that other comics would draw them into this world of panels and gutters more effectively (choice texts like Watchmen, The Dark Knight Returns, Wandering Son, Nausicaa, March, and more). Once they got their hands on a graphic novel they chose, they creaked open the door and took a few steps into this new room: not everybody, but more than I had seen up to that point. Ultimately, by the end of the semester, I no longer dreaded teaching this class. But I didn’t love it as much as I thought I would when I’d spent the previous years and summer hammering away at a keyboard, chiseling out curriculum. It had become like any other class I taught: full of some fun heights and some frustrating lows and a whole lot of boring middle ground. Yes, I found a way to open the door to a new generation of comics readers, but I didn’t figure out a way to have them walk through that door. But then again, isn’t that the case with any subject in school? And if many of my graphic novel students are treating my class like they do other classes, that surely should be a sign that comics are gaining that legitimacy I always wanted. As it is with any other subject, the doors are open, and it’s all on the individual if they decide to explore that room or not, if they decide to make this pit stop or continue on their path. Finally, no one will slam these doors in their face like I had them slammed in mine. And that’s a step in the right direction even if the finish line still isn’t in sight. Yesterday I had a phone interview with the biggest publication since I've started writing and self-publishing. Since the article won't come out until October, and since we still have details to finalize, I'm not going to mention the name of the magazine. 1) Originally the writer/editor was interviewing me for a short blurb on a their "Mixed Media" page, a page that has an extended article and a few blurbs. 2) Over the course of the conversation, he thought a deeper dive would be necessary, so he's going to try to get it bumped up to be the extended article on the "Mixed Media" page. That's part of the reason it's going to be published in October--if it'd been a short blurb, it would've been in an earlier issue. 4) After a few years of keeping my real name a secret and only doing business under my pseudonym, this article will "out" me; I'm going to keep using the pseudonym, but the article will mention my real name, the school I teach at, and more, all to focus on how I create boundaries between my comic work and my teaching work. 4A) The language in my comic has toned down a little (not out of fear of people finding out a teacher was using it--more out of artistic evolution and a greater focus on balance). So I'm not selling out, just becoming a better writer. 4B) Given that I make a strong effort to never push my comic on my students (or even name it or my pseudonym), I realized that complaints would be limited; if I made a big deal in my class about it, brought in my comic as a text to study, or anything else like that, I would worry about revealing my true identity (my real name or my pseudonym: you be the judge). 4C) Much of my writing career has helped make me a better teacher, and I think most people in the community would appreciate that. We talk over and over about teaching college and career skills, and for a teacher to have a better connection to career skills, most parents and guardians would view that as an advantage, not a disadvantage. In case you thought this announcement was going to reveal my true name, you'll have to wait for the fall when that magazine publishes its exclusive interview with me. Thanks, and let me know your thoughts! *Note* To see Week 1’s adventures, click here, to see Week 2’s adventures, click here, to see Week 3’s adventures, click here, to see Week 4's adventures, click here, to see Week 5's adventures, click here, and to see Week 6's adventures, click here. Weeks 7 and 8 is being uploaded soon to Graphic Policy. This comic was heavily inspired by my childhood: partially through characters and events, but mainly through the type of comics, books, etc... I was reading at the time. Jack is loosely modeled after me; he's a geek and a loner who loves comic books. I wasn't physically bullied like he is in this piece, but I experienced some verbal bullying and teasing. Because of this--like Jack--I often read comics, books, and other media as a form of escapism/wish-fulfillment. I sometimes pictured myself being like Wolverine, slicing through my enemies (I wouldn't really do it of course, but imagining it released stress temporarily--it might be worse for stress in the long run, but I didn't always use the best coping skills as a kid (still don't!). Sergeant Starbird is based on Spaceman Spiff, Calvin's alter-ego in the comic masterpiece Calvin and Hobbes. I loved reading this strip as a kid, partly because I heavily related to Calvin's overactive imagination and stronger desire to live in a fantasy world than deal with the schmucks in the real world. Now, to focus on the focus off this assignment: color. I colored the comic and Sergeant Starbird scene (one of those sub-narratives Brunetti talks about) with Copic markers; the rest of the scene was colored with colored pencils. This was supposed to show that Jack's fantasy life was more dynamic and more entertaining than the real world, which is certainly how I often feel about fiction vs. reality. I had also just purchased those Copic markers, so I was also looking for a chance to use them. But--as any good creator knows--balance and purpose matter, so hopefully you can see I didn't overdo my use of those Copics. The end result: a cross between Calvin and Hobbes and my own life. Ideas for next installments: "Jill in Jeopardy", which would focus on her similar situation (not very popular, uses books as escapism); "Jack and Jill in Jeopardy", which finds them bonding over their shared plight and entertainment preferences. See--it might start out a little sad, but it'll get happy eventually. *Note* To see Week 1’s adventures, click here, to see Week 2’s adventures, click here, to see Week 3’s adventures, click here, to see Week 4's adventures, click here, to see Week 5's adventures, click here, and to see Week 6's adventures, click here. Week 7 is being uploaded soon to Graphic Policy. Think of two artists: one "good" artist and one "bad" artist. Find a favorite page of the "good" artist and a least favorite page of the "bad" artist. Lately, I've been digging Chaboute's work, and I especially was enthralled by the style and storytelling in Alone. I picked this page from Alone for my "good" artist. As a kid, I loved Rob Liefield, but I've since come to dislike his style. I chose a page from his "Heroes Reborn" Captain America title, a title I read and loved as a kid (and I think I even drew this page in my early childhood attempts at drawing, which involved mimicking artists I liked). Now that you have those pages, you will redraw a panel from each page. First, redraw a panel from the "good" artist in the style of the "bad" artist. I tried to mimic Liefield's obsession with cross hatching, shading, and bulging muscles. I also tried to add a trademark "Liefield grimace", but I didn't draw that as well as he can. As far as the pose, this owes more to the Captain America pose--Liefield has a lot of dynamic poses where characters explode in all sorts of directions, even if it's not anatomically possible. --Compared to Chaboute, Liefield does have more dynamism and movement in a single image than most of Chaboute's images, especially what you see above (I'd argue that Chaboute has more movement and dynamism across panels, because Chaboute has a great sense of cinematic storytelling). --No surprise, but this dynamic movement is mainly suited to superheroes or other over-the-top action stories. I probably wouldn't use it seriously in a story, unless the Liefield style was being used to show something other than "reality" (a TV show the character is watching for instance); I also might use it if I wanted to vary art styles across a piece to show different "eras" (like Rob Veitch and Joe Bennett did superbly in Alan Moore's Supreme, itself a comic that Liefield created). I don't think I actually did a good job imitating Chaboute, but here's what I was trying to do--I wanted to use shading more like Chaboute (something I did with the gloves, boots and stripes on his torso). I also wanted to rein in the extreme proportions that Liefield is famous for, so this version of Captain America is a little more realistic-looking and relatable to an average reader than Liefield's is. However, I think that Chaboute is more detailed than I was; in trying not to add unnecessary details and cross-hatching, something I think Liefield often does, I might have simplified too much. It actually reminds me more of Paul Grist and his work, which can be seen below. --Chaboute doesn't have too much movement in a single image, whereas by copying Liefield's jumping Captain America in a faux-Chaboute-style I was able to bring more movement in that single image. I already alluded to this point earlier, but it bears repeating. --Chaboute doesn't have a lot of gray in his drawing; he relies more on stark contrasts between black and white. --With this in mind, I would use more of the dynamic poses (properly proportioned of course) in action scenes, but I'd also add more dynamic poses to small scenes that have a key action that might seem subtle compared to punching someone and jumping. I also would use a little more gray in setting objects like buildings. I don't think it's needed for the actual background or characters--I'd leave those using an interplay of black and white, but I think gray could add more depth to some background objects. While I'd still take Chaboute over Liefield any day of the week, this was a good activity to reinforce a key idea I have about creating anything artistic. There are no bad tools or bad approaches; there are only bad moments for those tools or bad balances of those approaches. That's it for this week: stay tuned for the last few entries! *Note* To see Week 1’s adventures, click here, to see Week 2’s adventures, click here, to see Week 3’s adventures, click here, to see Week 4's adventures, click here, and to see Week 5's adventures, click here. Week 6 is being uploaded this week to Graphic Policy. This exercise focuses on tools (use either a brush, a dip pen, or a technical pen--a fountain pen or marker also work) and the lines/shapes/textures each tool naturally makes or resists drawing. Fill each square with one type of mark, pattern, or texture made by one tool. Feel free to get as abstract as you want, making any types of hatches, blotches, use of pointillism, etc... Use all three tools on the page. At times, duplicate the same mark in a nearby box, but use a different tool. This helps you see which tools are better suited to make specific types of marks. In my example, I used only two tools--a technical pen and a marker--and I used one tool per row, duplicating the image beneath it with the next tool. While it might seem obvious, the marker was better suited for marks that were largely shaded or filled in; the technical pen was better suited for detail work and didn't shade very well (plus using it to shade wasted some valuable ink). The only step left in this exercise has to do with duplication and resizing: most comics aren't published in a 11 x 17 format, so it helps to know what your images would look like in a more traditional, printed format. To accomplish this, Brunetti recommends copying and resizing your work to 65%, 50%, and 35%. I did this, but I used 25% instead of 35% and 64% instead of 65%, just because those were the default resizing settings in my copier, and I didn't know how to change it. I like the 64% or 50% the best (even more than the full sized one). I think 25% is too small, and I don't think making it 35% would change my opinion on that. The reason I like the 64% and 50% better than the full sized version might have something to do with my confidence in my drafting skills. Yes, these are more abstract, so there aren't really many ways to mess up the drafting, but in the full sized version I noticed a few stray marks/marks that got away from me. The 64% or 50% versions are small enough to minimize those errors, so I can't see them, but they're not so small that I can't see the other, necessary details. Thanks for stopping by, and I'll see you for Week 8! *Note* To see Week 1’s adventures, click here, to see Week 2’s adventures, click here, to see Week 3’s adventures, click here and to see Week 4's adventures, click here. Week 5 is being uploaded this week to Graphic Policy. Imagine that you're walking in a desert and you come upon a cube. Describe (in writing or in your head) that cube. Think about size, texture, the material the cube is made of, whether the cube does anything (or whether the desert or something else acts on the cube, etc...). I thought of a small cube that was made of solid silver, gleaming to reflect the whole desert like a mirror. And--it might be cheating--but because of the desert locale, I pictured a pyramid (also small and made of silver) floating above the cube. The cube itself sat in the sand on the desert ground. With that in mind, we move onto the next exercise--one that uses this cube in a comic. 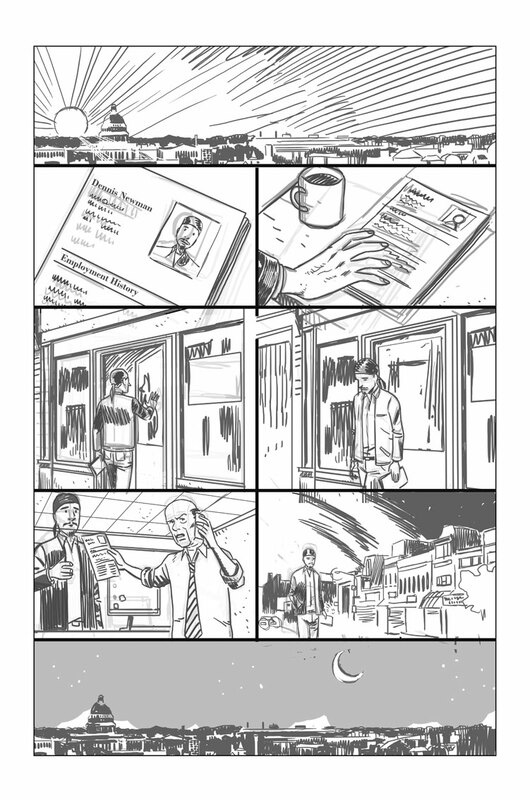 This exercise focuses on creating a one-page comic that tells a story about that cube. The main focus of this exercise, though, is to break away from a rigid, uniform panel structure and create what Brunetti calls a "hierarchical structure". If that sounds like some fancy edubabble, rest assured that you know what he's talking about. He's talking about creating a comic that uses different sized (and possibly differently shaped) panels. The hierarchical structure implies more subjectivity, according to Brunetti, more of a chance for the creator to emphasize and downplay details, to focus on tone, or to focus on actions in a more purposeful way. Essentially, he argues that you should use smaller panels to convey a claustrophobic tone or convey smaller actions, effectively slowing the pace. On the flip side, using larger panels conveys an expansive and maybe even intimidating tone and--generally speaking--creates a quicker pace to convey big actions. I've made adjustments like these to panel sizes and shapes in Rebirth of the Gangster, but I've still mostly adhered to a uniform grid, so this exercise was a fun reminder to vary it a little more. Here's my comic, which focuses on panel size but also went a step further (I'm looking for some extra-credit Brunetti! ): I place smaller panels inside the bigger panel (sometimes not even using panel borders for those smaller panels) to create an even bigger sense of immensity with the bigger panel and to have some more dynamic storytelling. I use some smaller panels to slow the pace and focus on small details (the second panel focuses on footprints in the sand and the third focuses on a foot slowly moving forward to leave one of those footprints); I also use a small panel to reiterate the sun and the heat, creating an oppressive tone (which is the closest to a claustrophobic reality this comic will get, being in the desert). However, the bottom panels create a claustrophobic effect, not in reality but in the feel of the image. The explorer is still in wide-open desert, but he's dwarfed by the huge pyramid, so the panels are smaller to make him feel more confined and claustrophobic in comparison to the pyramid. (I moved away from the cube and focused on a pyramid rising out of the ground). The biggest panel is clearly the pyramid, but it's filled with other smaller panels (other smaller moments): The top of the pyramid is in a separate panel to convey that the explorer only sees that at first. That panel features a "RUMBLE" sound effect which--combined with the explorer rolling down the page in mini-panels and the ground changing (the horizontal lines)--indicates that the pyramid is rising. I like this approach in general, because it keeps setting and the pyramid alive while still moving story/character forward with small panels, but I still need to figure out how to clarify to the reader that the pyramid is rising. (Maybe more sound effects and a true small panel on the right side that shows the pyramid rising next to the unsteady feet of the explorer). All in all, a fun exercise and cool product, despite that area for improvement (and yes I know I don't have, shall we say a "classical" drawing style, so that's an area for improvement: I have resigned myself to focusing more on improving storytelling than drafting skills for the time being, which is the bigger issue in the above comic). Today marks a special day for all romantic relationships. But at the risk of offending my girlfriend, I'm going to focus on the second-most important relationship I've had in the last few years (my girlfriend being the most important, of course). Over the last few years, I've loved working with Juan Romera, the artist of Rebirth of the Gangster. I wrote up an appreciation of our collaboration that will be posted on Graphic Policy in a few days (link to come), but for now, I'll give you a sneak peak! Last week I wrote about finding the right artist--and I definitely lucked out in finding Juan, a perfect match for the story I wanted to tell. Wait: the story we wanted to tell. Even though I lucked out in getting such a great talent, we didn’t have as dynamic and smooth of a collaboration when we started issue 1 as we do now. Part of that might be because I was too controlling/too descriptive in my scripts, and part of that could be just the natural journey in any collaboration--the more steps collaborators take on that journey, the more they are able to convey directions that used to take a whole sentence with a simple word. And that’s led to some great work in the last year and a half of our creative partnership. Check out one of my latest Graphic Policy posts, a Flashback Friday appreciation of James Robinson's Starman. Melded with an appreciation for the art and the writing, I document some of my earlier collecting days, part of the reason I love this superhero series more than most. And what a way to start: with a comic written and drawn by yours truly! I plan on making this the first of a running series, although it won't be daily or weekly like most newspaper comic strips. For those of you familiar with older strips, you'll notice the influence of Calvin and Hobbes--my favorite newspaper comic ever. Stay tuned for future Jack in Jeopardy comic strips, along with some behind the scenes blog posts. Now that you've purchased Rebirth of the Gangster Act 1: Meet the Family for the greatest gift of the year, take some time and read my latest post on Graphic Policy, walking you through the process of writing and revising a script, starting with my own beginning: issue 1! Hey everybody, I'm still alive! Sorry for the delay in updating this site and blog, but I've been spending a lot of time getting ready to roll out a new graphic novel edition of Rebirth of the Gangster Act 1: Meet the Family. I've also spent time finishing writing and lettering issue 7, which will release on November 15, coinciding with the release of Alterna Comics' 2017 IF Anthology, which features an excerpt from issue 3 of Rebirth of the Gangster. Finally, I've been setting up author signings, the first of which will be at the Madison, WI East Towne Barnes and Noble on Saturday, December 2 from 11 am - 2 pm! All that, and I started teaching a new school year. Speaking of teaching, I have a bunch of essays to grade for the end of the quarter, so that's all folks! At the top left corner of your paper, draw a face--adding only a nose and eye, along with an eyebrow above that eye. This week had a homework assignment (I don't know why he differentiates between homework and exercise). And to be honest, there have been other homework assignments I haven't done (as a teacher, that seems hypocritical, but this course isn't for a grade, just for my growth). 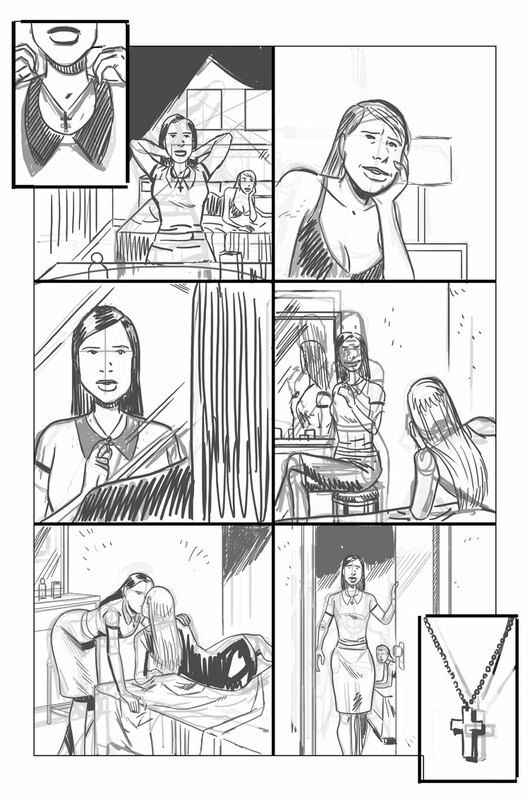 The assignment: create a 12, 16 or 24 panel strip, making each panel the same sized. Create a basic design for a character and draw from it from a few angles. I created a robot character with a wheel instead of legs. Then, brainstorm a location to set your comic with this character and a verb, an action for this character to do. I set it in a factory and wanted the robot to hug someone/something, to add some pathos and emotion to this character. Create a page with 8 evenly divided panels. For panels 3-6, draw the character doing your brainstormed action in the preset location. Avoid shifting perspective too much, but when needed, shift and use the angle character study you created. Then, draw 2 panels (panels 1-2) to show why the character is doing this action; add closure by drawing the consequence(s) of this action in panels 7-8. Here's what I came up with--good luck with yours! Draw a one panel cartoon for each of the below scenarios; spend 3-4 minutes on each cartoon, you can't use any words and you can only use black and white. Brunetti specifically says to use a notecard for each of them, but I just split a page into 12 squares, since I didn't have notecards on hand. G) What happened right after cartoon F? Take 4 of the panels and arrange them so they tell a story. Study if any beat is missing. Rearrange the order and see what has changed--is it still readable or has it now lost its narrative? Finally, decide on the best order that tells the most concise and engaging story. Without knowing it, you just brainstormed your way into creating a four-panel comic. The next exercises will refine this ability. I decided to organize my panels this way: H, J, K and C. Essentially the first three were all the exercises asking me to draw parts of what happened this morning (the cat walking me and the gf up) and the last one is a rough looking self-portrait, which is sometimes how I feel when I've woken up early to a cat's hungry meows. Over the course of the week, take note of 12 small objects and write them down. Then, brainstorm commonalities for all 12. After that, eliminate 2 objects, because they're most dissimilar to the rest of the objects. The purpose of this is to create more and more connections between things--which is what art does after all--but to see what can be jettisoned to be more streamlined--which is what great art does after all. watch, lunchbag, strainer, phone, book, cleats, notepad, picture frame, lighter, nametag, cat toy and waterbottle. cleats and waterbottle; being associated with sports, exercise and outdoor activity it didn't fit as much with these things found and mainly used in a house. 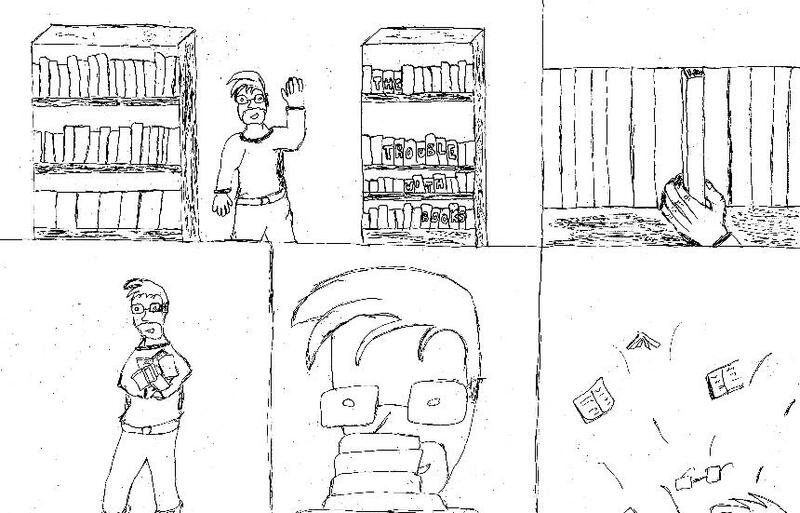 Create a one-panel cartoon adaptation of a famous literary work. Brunetti gives an example of how he would adapt The Catcher in the Rye, a piece he recommends because there aren't already film adaptions or comic adaptions of this piece, so the visuals are more original. To see that, though, check out the book, because it's insightful, but too in-depth for me to go into without risking copyright infringement. I chose Guards, Guards by Terry Pratchett, which focuses on a Night Watch group (although this group has seen better days, with only 4 members, 3 of whom don't enforce the laws and just get drunk instead--the only one who does is a new country boy who enforces dated laws from an old book he had read). And in the midst of this lack of law, a dragon starts terrorizing the countryside. "That dragon is in violation of law 24.5--an unnecessary and unapproved flight path." "What are we supposed to do about it: we're just the Guard. Have a drink." Get handful of index cards and write phrases/sentences that you've heard recently (from eavesdropping, conversations you're actually a part of, something you saw on TV, etc... Brunetti didn't specify a certain number, so I just went with 5 index cards; you should use 7 or more, since the next exercise involves drawing 7 single-panel images and then pairing them with these phrases. Using some new index cards draw a single-panel cartoon (no words allowed) of these things; then pair them with the index cards from 2.1, mixing and matching until you find the best caption. The intent behind this is to show that sometimes the funniest or just best comics happen when juxtaposing things that don't seem to go together. It also shows that we should pay attention to the world around us, because it might offer the best way to complete an idea. Check out my work! I've typed the captions and scanned them, because my handwriting is so awful someone might not be able to read the scanned caption. CAPTION: IT WAS A HOT MESS. CAPTION: YOU CAN'T HAVE YOUR LAPTOP BACK TIL YOU GIVE ME YOUR CHAIR. CAPTION: I DON'T KNOW HOW. 5) the saddest thing you can think of (an alien landing on Earth and, first thing, shooting a library with a space ray gun). This is one of my favorites--either my favorite or second favorite--because of the unexpected caption, but I did cheat and make it a few panels, all wordless. CAPTION: ...SO THAT'S WHAT THAT'S FOR. 7) something boring or mundane (sleeping the months away and doing nothing). This is one of my favorites--either my favorite or second favorite--because the caption both fit and didn't fit (he's cooped up inside so needing a door open kind of makes sense, but a closed door shouldn't make someone sleep a couple months away). I also did a small cheat and used the ZZZs to indicate sleeping, but they don't count as words--they're accepted symbols for sleeping--so I think it's fine. CAPTION: CAN YOU OPEN THE DOOR FOR ME? 1) It shows that when a cartoonist simplifies and boils drawings down to their most basic components, the image is still recognizable and universal, which can actually make a simpler drawing better than a detailed one. 2) It also shows that obsessing over a drawing for hours isn't the best approach, because we often add unnecessarily details that distract from the needed, fewer, universal details. This is what I did, and I think it's better than the previous exercise, partly because I was free to draw what I wanted (instead of other people's creations) and because a simpler cartooning style suits my, shall we say, less-than-refined drawing abilities. This exercise follows these guidelines: From memory, draw quick doodles (spending about 10 seconds or so on each) of about 25 famous cartoon/comic characters. 1) It shows that the most recognizable characters are often still recognizable in the rushed pen of a layman or laywoman; this is generally because those recognizable characters have been streamlined, so we remember and recognize them from less detail than we would think. 2) It also shows that to draw these characters perfectly, most people would need a model to look at, which also raises the issue of consistency: if we want to cartoon ourselves, we have to create a character than can be duplicated relatively quickly with a constant consistency. These are some of my doodles; I think the comic characters and Homer Simpson looks good, but some of the other aren't very recognizable. 1) Draw a car in 3 minutes. 2) Beneath that, draw a car in 1 1/2 minutes. 3) Beneath that, draw a car for 1 min. 4) And so on, using more intervals like 45 sec, 30 sec, and 10 sec. 5) Repeat with other objects like a castle, cat, and more. The intent behind this exercise is to streamline your drawing until you have the most iconic and universal representation of that image, while still being detailed and polished enough to ground it in some reality. This is what I did for the car and castle versions; I think my best in each was my third try, which was always around 45 sec-1 minute. With less time, my drawings got even worse than my natural skills already are, and with more time, my drawings got too messy but in a different way: too messy with details. Fun first exercise with some good learning opportunities. No new post, just some new art for the sixth issue of Rebirth of the Gangster! I also realized that I loved writing for comics. I mean, it shouldn’t really have been a surprise, since I’ve read comics obsessively since I got a Christmas gift of 30 X-Men comics from my parents, but I had been stuck on this idea of establishing my literary merit with a novel before switching to comics. I had the mindset I’d often raved against: that comics can’t be seen as serious literature. (Don’t worry--I don’t believe that now, and I didn’t really believe it wholeheartedly then. I was just letting fear run my life more). "First Shot: The Making of Rebirth of the Gangster"
Now, that I’d done my research (see my first post, located here), I started creating the project: first focusing on rewards. I followed the lead of Kickstarter and other advice found in my research, and I asked my artist Juan Romera what he could offer. He offered a few things, but the winners mainly consisted of sketches of varying sizes. Other than getting Juan’s suggestions, I had to consider a few more things. First, I had to be realistic about what Juan and I could do in a reasonable amount of time following the Kickstarter’s completion. While I might want to write a 50 page short story for every backer that gave me $100, it’s not realistic to do so. In connection to this, I had to be realistic with the cost of rewards. It might be cool to print copies of the book for every backer that donated $1, but with a $3 cost per printed issue, that would only leave me in a worse financial position than I was in before the Kickstarter. I also had to consider a fan perspective: while some behind the scenes stuff is cool, if I go too in-depth with those types of rewards, I would only entice creators, not fans. I started with some basic rewards (pdfs of the first comic for $1, pdfs of the first two issues for $2, I’d follow you on Twitter or friend you on Facebook for $5, rewards that didn’t cost me much), and mentioning the backer in a closing acknowledgment or opening dedication for $10 or $20 respectively. Then I started jumping prices on the rewards more: $25 for a look at my first comic script ever, for an unpublished comic called The Eye of the Beholder, and a behind the scenes look at Rebirth of the Gangster–on sale at Amazon as “First Shot: The Making of Rebirth of the Gangster”. I followed these with my high tier rewards: popular ones like original sketches by Juan for $35 and $55 depending on the size (as limited offers, which made it realistic to ask this of Juan) and some other rewards that didn’t work so well, like naming Marcus’s grandpa, and feedback from me on a script the backer wrote. But my most popular and lucrative rewards were making a cameo for $100 and getting an interview with me for $125; the cameo was limited to three backers, so it also was realistic to add a few new roles in a 22 page script, and the interviews are things I would do to promote the comic anyway, so I wasn’t really hurting with a time-commitment on that one, even though it wasn’t a limited offer. As a last note, all of my rewards were cumulative–if you paid $10, you’d get that reward and the ones below that. The only exception to this were the limited offer rewards that only let a few people purchase them; those limited offer rewards received everything below it, but rewards above them couldn’t get the limited offer reward. The above rewards didn’t have many backers–partly because they were limited offer rewards, only letting 2 or 3 people receive them–but clearly they helped my campaign the most, contributing to 62% of my total money raised. The smallest donations for rewards–seen above–didn’t help my overall campaign fund much (only 3% of total funds raised), but I like to think they’re still useful, because they get more people reading my comic than would otherwise. Low cost rewards offer little risk to backers with the large reward of backers feeling like they made a project happen. High cost rewards were most attractive when backers were directly involved–and readers could see their involvement–in some component of the creation, like having a cameo. This was my most successful reward; many asked if I could add another cameo reward (and I added one, but stopped at that, because I wanted to save Juan’s sanity). Some high cost rewards–like the interview–didn’t attract people for the reward, just for the chance to feel good about supporting my project in a big way. I actually didn’t have requests from interviews for these backers–they were friends and family that supported in a big way. Most people don’t want to pay money for social media connections. They probably realize that I would want to connect with them anyway, so I can have more options of getting the word out. This reward was mainly self-serving on reflection, and many backers saw that. The smaller sketch artwork was too small (I even had one or two backers change from that reward to the bigger one because they didn’t think about that size closely enough). Essentially, backers want a sketch that’s around a typical comic book size (8×11). Maybe because I wasn’t established enough, but the reward promising feedback didn’t work at all. I’m sure for established greats like Neil Gaiman and Alison Bechdel, that’d work. But then again, they probably wouldn’t be using Kickstarter. Although people were interested in the behind the scenes stuff, I didn’t get a lot of positive feedback about that: just positivity about the comic and the opportunity to support it in a more meaningful way than a few bucks. A few months back–about two issues away from being done with my first story arc and graphic novel–I started thinking about another Kickstarter campaign, only this time funding a printed copy instead of digital copy of the series. I always planned on releasing individual issues as digital copies only and then releasing graphic novels as both printed and digital copies, partly to save costs and partly because as a comic reader I really only buy trades. I brainstormed a new list of Kickstarter rewards, keeping the oldies but goodies and adding some new ideas for a wider reach and better fan appreciation. While I eventually decided to just go with Amazon’s print on demand service (since it saves me the financial commitment of purchasing a specific print run; it also saves me the time and cost of a Kickstarter campaign; and it ultimately avoids the issues of purchasing a specific print run–namely, buying too many or not enough copies of the graphic novel). Really, I decided that running another Kickstarter wasn’t worth the headache at this point in the graphic novel’s publication (and at this point of the school year–as a teacher, I know that the end of the school year is always the most hectic, so it wasn’t worth it to me to stretch myself so thin with another Kickstarter). I wanted any extra work done on my comic to affect my comic itself–the story and the art–not the publication of it. Despite this conclusion, I thought it would be useful to share with you my list of possible rewards and my reasons for keeping some rewards, jettisoning others, and adding some new stars. I wanted to keep the Twitter/Facebook rewards but with a twist. In my first campaign, I promised to follow/friend people, but it seems like people were more interested in a shout out of appreciation. I would change it to the shout out and reduce the price, since that would be a good small investment–others like the idea in my first campaign but not the price. I’d still keep pdf copies as rewards for small-time investors, although making them more expensive than the Twitter/Facebook rewards. Since people liked the cameo, I decided to add a “Suggest a Character” reward for about $10; that way I wouldn’t have to commit to a lot of characters if I only have room in the outline of a certain issue for a few, but it still gives backers a feeling of contributing to the project financially and creatively. I’d also keep the Acknowledgments reward, since I think people deserve a shout out on the graphic novel. I’d add a printed copy, since that’s the reward, and I’d price it at retail price, about $20-25. That way, I wouldn’t be losing money and backers would still feel it’s a deal, because they’d get the printed copy and the rewards leading up to it. For about $10 more, I’d offer a signed printed copy with either just me or just Juan signing it. Promising both would lead to big mailing fees and time concerns that wouldn’t be worth it to me. Although the interview reward worked well, I’d change it by lowering its price and offering a guest blog post as an alternative to the interview/podcast appearance. Some smaller websites prefer that since it adds to their site without too much time commitment from them. And, as I think I’ve mentioned, most people who backed this didn’t even request an interview, so I wanted to give another option to widen its appeal. I’d keep the cameos and sketches from Juan, unchanged, since those were the most successful. I’d add two videos: a director’s cut video for a specific issue and a director’s cut on how to create a comic in general. Stay tuned to later posts for some video analysis: it helps, but the one video I had on my campaign needed improvement, something I’d hope to do here too. My last two additions would be new rewards: I’d write something that looked like fan-fiction, creating a 5 page story of the backer in the Rebirth of the Gangster universe. I’d also offer a 2-page short story, unconnected to this universe. Because of the length, I’d ask for more for the Rebirth of the Gangster fan fiction style story. Both are short, because I wanted to balance reward with the time commitment on my part. Eventually, I might use these rewards for a campaign later in the publication of Rebirth of the Gangster, or even in the publication of one of my other story ideas (The Others Behind the Wall, a mix between Lovecraftian horror and Stranger Things sci-fi, and A Story for Kari, a fantasy that uses my own long-term relationship as the basis for the romance). But before that day, there is still more from my first Kickstarter campaign to reflect on and use for future planning. But I’ll cover that in later posts in this series, so stay tuned! Congratulations! You–like me–are the proud producer of independent content, either because you didn’t produce something that interested Big Pubs, you’re too new as a producer of content (and need experience before you can get experience), or because you could get big publishers’ interest but prefer having complete creative control instead of having an editor murder your darlings, as they say. And, by the way, no judgement on whatever your reasons are for producing independent content: in my case, my self-published comic Rebirth of the Gangster sparked some interest from publishers but not enough to get them interested in backing my project, partly because I was so new. In fact, if I’d trimmed Rebirth of the Gangster from a proposed 500ish page series to a 150ish page graphic novel, Dark Horse would’ve been interested. Because I have a day job (teaching, sometimes teaching comics in the classroom, as I’ve written about), I refused to neuter my story that way. My influences refused to compromise, so dammit, why would I? So, again, no judgement, because–like me–you probably have many reasons for entering the self-publishing game. I’ll say it again: congratulations! But you still have a long way to go to get your product made and distributed on a larger level. Now that you’ve decided to rely on yourself to publish this content, you need to figure out how to finance the whole thing, how to crowdfund something to get it out to an even bigger crowd. Having run a successful Kickstarter campaign myself a little under a year ago, I know the stresses of this process, along with the joys when someone donates even $1 to your cause. Throughout that journey, I had a lot of hills and valleys, but I learned a lot and could avoid some of those deep depressions if I were to run another Kickstarter. And maybe more importantly, by sharing my reflections on that journey, I can help you create a Kickstarter that’s even more successful than mine was. After all, I was so successful, because I relied on the advice of others, so it only seems fair to pay it forward, a style of thinking heavily encouraged by all crowdfunding sites. And that advice of others was the first place I started. Because as any writer will tell you, research is the fun part of the job and the real reason we do this! In all seriousness, though, it’s indispensable, even if it’s occasionally boring. The first step in research was to look at Kickstarter’s requirements, including what is not OK to post on the site or offer as rewards (like a % stake of the profits on your projects–Kickstarter isn’t Wall Street people). One of the most important things to look at, though, are Kickstarter’s fees, both their general fee and their payment processing fee. Don’t ask me how those two things are separate, or why they don’t bundle them together, because I’m a writer, not a mathematician darnit! However, even if you don’t understand the logic behind some of these fees, you need to take them into account. Otherwise, you might set a goal without considering those fees, have the Kickstarter tax man come and skim a little off the top, and be left with not enough money to publish your comic, produce your movie, record songs, etc… Here’s a quick breakdown of how fees affected my total earnings once the campaign was complete. How a campaign presented the project, the creator(s), costs in a transparent way, and the timeline. Trust and sympathy are key in Kickstarter campaigns, so if they don’t find a hook to latch onto your product, if they don’t like you, if they don’t know how you’re going to use their money, or if they don’t see an end date in sight for this project, they’ll do the Kickstarter equivalent of swiping left. How a campaign used a video to present their product in a clear, concise and engaging way. We live in a visual culture, so if you don’t have a strong video, many people won’t even read your gold standard writing mentioned in the first bullet point. How others advertised their Kickstarter. One of the best pieces of advice: build a fanbase before running your campaign. I had about 500 Twitter followers, along with support of family and friends, which was a good start, but if I could go back in time, I’d focus a little more on connecting with fans earlier and finding fans earlier. Congrats again! You’ve finished the research, and now you just have to create your campaign, cajole others into supporting it, create the thing, and deliver those rewards! That should be a breeze, right? Well, don’t worry, because I’ll cover those steps in upcoming segments. A few months ago, for one of my English classes, we dove into the murky waters of refugees, examining the motive behind closing off borders and the way in which that fits or doesn’t fit American ideals (hint: I don’t think it does). The conversation quickly became pretty heated, with most of my students arguing for letting in refugees against a few very vocal opponents. I’m not going to unearth every part of that conversation, but I do want to dust off the jewel offered by one of my students who is Muslim and has family friends that are refugees--one of those family friends had her family killed by ISIS, a long cry from being an ISIS member herself. 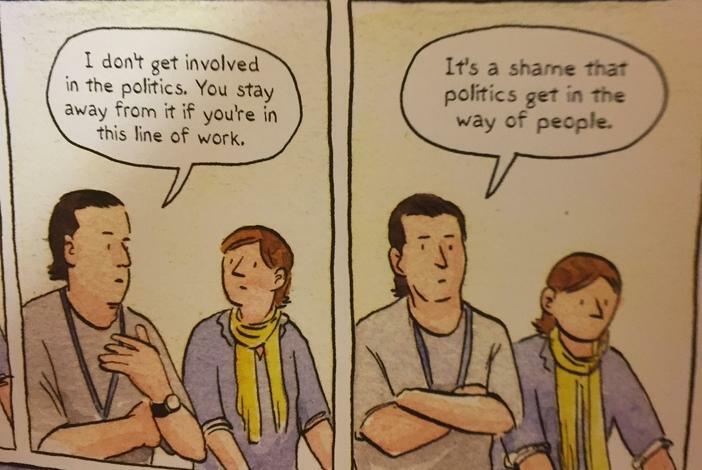 And perhaps this is the very reason that a graphic novel like Rolling Blackouts exists, a non-fiction graphic novel that follows Sarah Glidden as she journeys with journalists to Turkey, Iraq and Syria to examine refugee life. Yes, it discusses refugees who fled Iran after the US invaded (running to countries like Syria and Turkey) not refugees fleeing Syria. But, the core of the book--its attempts to anchor this abstract issue with real people and stories; its examination of what journalism is and what the responsibility of journalists should be; its insight into the impact this war had on US soldiers--all of those are not only still relevant, but even more relevant than they were in the time period this non-fiction graphic novel covers. But no matter how relevant a text is, people will throw it aside if it’s not any good. Fortunately, that’s not the case: Glidden has a subtle, yet effective, sense of structure, of how much detail to include in a panel (her cartooning style is simple, warm and enormously effective), of how much exposition to give so it informs rather than weighs down the story. 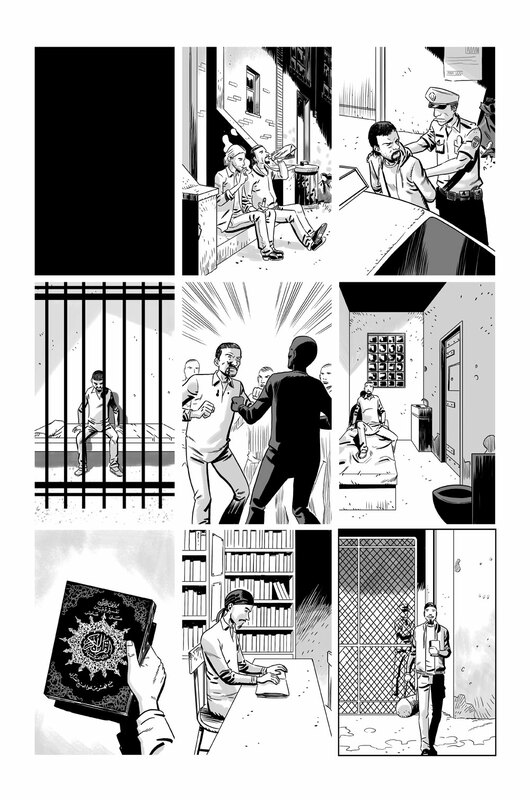 The graphic novel expertly shows that refugees are people, but that doesn’t mean it glorifies them to sainthood. No, it means that it shows them with their hopes and fears, their successes and failures. For example, we visit with refugees who were formerly middle class, mainly concerned about their children’s ability to go to college and live a better life. That’s not too far from the American Dream, but then again, the US doesn’t hold a monopoly on the idea that children should become more successful than their parents. At the same time, we see refugees who harbor a lot of hatred towards the American government, although this hatred that doesn’t prevent them from dealing with Americans kindly, realizing they don’t can’t treat a person as a generalized group...if only we had the same compassion and curiosity. If this piece of graphic journalism only concerned itself with removing the blinders that prevent people from truly seeing refugees as people, it would be a powerful work of art. But Glidden doesn’t stop there. As in the real-world, one topic can’t be separated completely from the rest: each person and event is connected by silken strands to others in the web. And it’s almost impossible to talk about refugees without talking about the role of media in their story and the role that US soldiers played in their exile. Although Glidden is not a journalist by trade, she reports these scenes with so much objectivity and emphasis on relevance that one could almost believe she is working from the same cook book that journalists use. Glidden knows how to balance ingredients so that one taste doesn’t overpower. She knows how to make them gel into something greater than the individual parts, much like a cake is greater than an egg or butter. And this journalistic instinct also serves her well when turning to the subject of journalism itself. Glidden focuses on the controversial parts of journalism--the commercialization of it as industry, the need to keep audience reaction in mind when shaping a story, the at-times naive ambitions that let journalists see themselves as an authority on objective reality. These snapshots of the challenges of journalism combine with the images of journalists acting nobly to create a collage that dazzles in its complexity. Last year, I wrote an article for the now-defunct Slant, celebrating the 20 best comics of 2015 (headline graphic for that article below). 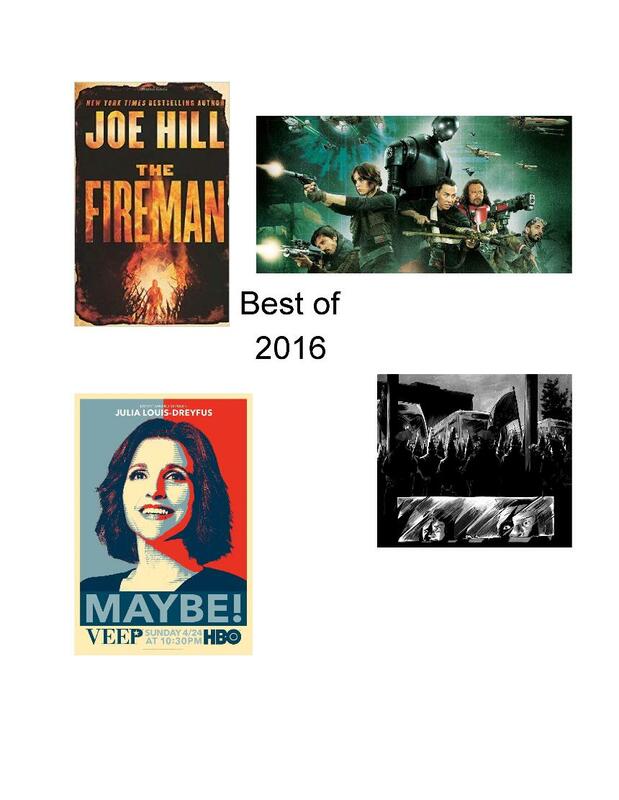 I wrote some other cool articles for them, some more serious--like my article around this same time last year about the parts of MLK’s message we ignore or downplay--and some more fun--like what to expect out of Netflix in 2015. Yeah, I know some people binge-watch as if it’s a matter of life or death, but let’s keep our priorities straight. Slant quickly went under, even vanishing from the seemingly endless web: the link that used to work for my article no longer does. However, if you’d like to see the article in it’s entirety you can find the Google Docs draft here. Since I haven’t joined with any other news site like that, and since I enjoyed spending almost 10 hours on that list, I thought I’d create a list here. But it’s not just going to be about the best comics of 2016. Despite my joke at the beginning of the piece, I binge-watch with the rest of them, and I am constantly juggling multiple books. And it’s not just going to be about entertainment released in 2016--like the rest of us, I sometimes fall behind the curve when gluing myself to a page or screen. To that note, I’ll have two categories: best ____ published in 2016 and best ____ I read/watched/listened to in 2016. Unlike my 2015 countdown, I’m not listing 20 items per category, because I want to finish this list before 2017 ends. I’m just listing one, so this list is all about quality instead of quantity. I’ll end this article with a section for “Honorable Mentions” and a section titled “Things Released in 2016 I Haven’t Experienced Yet” because I’m sure many people will look at my list and wonder why something better didn’t earn that gold medal. Maybe your top choice didn’t wow me enough to earn that title, but it also could simply be because it’s not on my radar yet: my wallet was too empty to buy it last year, I’m the 100th person with it on hold at the library, or I just wasn’t in the mood when presented with the opportunity to read, watch or listen to that piece. And even these two sections won’t be exhaustive, but they will at least give a bigger picture of my reading history and hopes. John Lewis’s gripping story comes to a masterful close this year. Like the previous volumes, it shines a new light on a much discussed topic: the American Civil Rights Movement. And like the previous volumes, it manages to add a face to this story, to give this historical movement heart. And not only is this one of my favorite graphic novels; many of my students--including those who don’t read the assigned books, let alone read for pleasure--have picked up all the books in this volume. And that’s what great literature does. It shows the personal and the political, the uplifting and the downtrodden, and in doing so helps us uplift ourselves. I’ve read some of Jeff Lemire’s work before and liked it a lot, but I hadn’t truly seen his star shine until I went back to his work that started it all. Maybe it’s my background growing up in Minnesota and loving the North Stars, and maybe it’s just the humanity behind the characters, but I could barely put this book down. Even at night, an hour or so after my girlfriend had gone to sleep, I still flipped pages while she tossed and turned next to me. The artwork for this graphic novel might not be great in classical terms, but it’s perfect to set a tone, convey theme, and let characters act. Don’t do what I did: stop waiting and pick this book up! While there are certainly books that felt more important (Hillbilly Elegy was certainly powerful and timely), this book was the best combination of excitement and thought-provoking I read this year. I took it on vacation to Disney World and had to be dragged out of my room sometimes just to actually explore the Magic Kingdom. But I was reluctant because I was already experiencing a magical world in this book. The main character’s fortitude, compassion, and love of Mary Poppins made me wish I knew her in real life; the sci-fi trappings of the explosive plague that ravages the world provided plenty of intellectual fodder; and the meditations on how to build a community and use power instead of abusing it all made it a hefty book, both in size and importance. I’ve loved fantasy since I first cracked open The Fellowship of the Ring in elementary school, but few fantasies have ever duplicated that feeling. I’ve appreciated some fantasies more than The Lord of the Rings, but I’ve appreciated them more as different types of fantasies, like Jonathan Strange and Mr. Norrell. That book isn’t epic fantasy and has a much bigger emphasis on humor and wit, with equal measures darkness and heart. But until I read The Summer Tree, I hadn’t read an epic, questing fantasy to compare to Tolkien’s masterpiece. Like Tolkien’s work, this features a small fellowship trying to bring people together to stop a deep evil. Like Tolkien’s work, it’s influenced by Celtic mythology. Unlike Tolkien’s work, it offers more heart and humanity in the midst of an adventure and mythology as intricately plotted, if not more so, than Frodo’s adventures. Maybe that’s because the main characters are humans instead of hobbits, elves and dwarves. Maybe it’s because Kay knows that life--and the best art--stabs your heart while also patching it up. Maybe it’s because Kay knows that the best art, like any good song, weaves the hopeful with the hopeless in equal measure. And that’s a tapestry to behold. The only thing funnier and scarier than the real-life politics of the year, especially the presidential election. Julia Louis-Dreyfus shows why she’s the only Seinfeld alum to truly shake off her character and typecasting. She’s hilarious, and despite the fact that she’s often an atrocious person, she can be relatable, possibly because of the ineptitude of her staff. And they also are hilarious--Tony Hale is funnier here than anything I’ve ever seen him in, including Arrested Development. This is truly a show to watch and escape the real world of politics, although perhaps it’s not as much of an escape from the real political “show” as we’d like. I had seen some episodes of The Larry Sanders Show before and loved them, but I’d never really dived into it, possibly because it’s not available on streaming platforms, but possibly also because as an older show it was always pushed out of the way by the new and better. But in this case, as in so many, the new actually wasn’t the better. Like the rest of the world, I joined in mourning Gary Shandling’s loss, and I figured the best way to do that would be to enjoy and celebrate his work. And even though so many mourned Shandling’s loss, after finishing the last episode of the series I began to wonder why we didn’t mourn him even more. The humor, heart, and innovation in The Larry Sanders Show laid the foundation for so much of the work currently being done in TV and film, and we should thank Shandling for being the great art inspired. As in the case of The Fireman, there were stories of more importance released this year, films that I would be tempted to give the gold medal to, but in my heart I knew I would only be doing that to seem more intellectual, more elite, more respectable. However, the movie I truly had the most fun watching (only a few weeks ago in early January) was Rogue One, a movie that also pulled some heart strings and offered some food for thought surprising out of a franchise built on action. Yes, it’s filler that doesn’t advance the continuity of the Star Wars mythos in a significant way, but it’s so good and it filled me with a sense of wonder that I didn’t get from The Force Awakens. Don't’ get me wrong--I liked that movie a lot too, even though it wasn’t adding anything new structurally or tonally to the Star Wars film universe. But Rogue One did, and it’s exciting when a franchise long retreading the same territory offers a fresh perspective. And after all, what better film to help escape the real world than one that takes place in a galaxy far, far away? This movie was the best thing I watched the past year, and it will probably be the only time I ever watch it. It’s so intense, so engaging and so singular a vision that I felt changed after I saw it, but I instantly knew that I wouldn’t soon revisit this territory. In many ways this movie is the polar opposite of Rogue One--it looks to the past instead of the future; it’s moments of violence are small, torturous and never glorified; if revels in the natural instead of the fanciful; their is little dialogue establishing character (because the actions and acting already do so perfectly--let alone dialogue for exposition. This movie reminds me of another Oscar winner that I love but hold no immediate desire to see again. 12 Years a Slave had the same impact on me. I finished it, had no idea what to do with myself in the face of such majestic filmmaking and knew that the film was so heavy (emotionally and intellectually) that I can’t revisit in the same way again. Most of my favorite works are things I want to read, watch or listen to over and over, but true art can echo throughout our lives without that constant re-reading, re-watching, re-listening. Years ago, back when e-readers first hit the market, I asked for a Nook Color for Christmas (Yeah, I get it. Why not a Kindle? Well, the Kindle didn’t have color then, and I love comics, so the Nook made perfect sense at the time). That Nook is loaded with hundreds, maybe even thousands of comics and a fair amount of actual books; if it were a bookshelf the whole thing would have collapsed in a pile of splinters by this point. And much like my real bookshelves, most of those texts sit there in that virtual space unread, one of many ever-increasing possibilities for a future escape from the real world. And that’s not my only device for e-reading. A year or so ago, I was given a Kindle, joining the majority of America using that as their preferred e-reading device. I’ve mainly only read my own comics on this Kindle--the issues of Rebirth of the Gangster I’ve written, shameless plug-- something I do to see how they look on a Kindle device instead of the computer screen version I see in the preview before uploading them. As a writer I do have some ego issues, yeah, but it’s not like I’m so obsessed with myself I only want to appreciate my work; I’m not Kanye after all. But the more spins of the Earth that go by, the more I find myself leaving those e-readers tucked in a corner of my room, gathering dust. The longer I had Marvel Unlimited, the more that app remained pasted with other apps on the background of my phone instead of popping to life. The more that I have access to seemingly unlimited virtual choices, the more I long for the feel of paper between my fingers, the heft of a hardcover. It’s not like I’m some Luddite looking to crush circuits and smash smart phones (I do love Black Mirror though, which might be a sign that I’m not ready to give in to the technological current sweeping across our world). No, I’m not some technophobe--in fact, I have only been able to create Rebirth of the Gangster because of our advances in technology. My artist, Juan Romera, lives on a different hemisphere than me. We have never spoken or seen each other's’ faces; but we’ve formed a deeper connection through email than I have with many people I see on a daily basis. Juan only illustrates digitally, something I didn’t even know until after I’d worked with him for a few months. I only found out about this, because I wanted to offer original page art as a Kickstarter reward for the series; Juan graciously corrected me and offered to draw original sketches as a reward instead, which worked just as well. Almost all of my comic-creating process uses technology--I even release individual issues digitally (with the story arcs to be printed in later graphic novels), something out of the pages of science-fiction only decades ago. So, if I am so reliant on using technology to produce text and art, why am I so hesitant to use it when experiencing a work for myself? I guess some of it stems from that contrast: I use it a lot to produce but not to consume. I stare at a screen, straining my eyes, most of the working day and sit in front of screen to Netflix and catch up on my shows. My eyes demand something else, something that doesn’t startle them like a thousand camera flashes constantly flaring in front of them. And reading traditional texts gives them that breather. But maybe even more so than this physical reason I seek traditional texts, there’s an emotional one. When I lug around a paperback for weeks (maybe even months, depending on my work commitments or my interest level in the other books I juggle--yes, like many, I read about 3 books at a time with graphic novels also thrown in for equal measure), when I have this paperback with me for so long the memories of that moment, the signposts for my life, seep into this paperback. And then, years or even decades later, when I see that same cover image, I can vividly remember what was going on in my life when I lost myself in that world. I haven’t had that experience with an e-book yet; in fact, not only does this that e-text remain dissociated from my life and memories, I am less likely to remember the content--the adventures, characters, and ideas--than I am with a book in which I flipped back and forth between pages. All of this, by the way, isn’t to say that I will never use e-readers or that you should never use them; I just have become more aware of the trade-offs involved, and I hope you do so too. So, if it’s more cost-effective (because of a Netflix-style streaming service) or more effective to lug around an e-reader (who’s going to pack a suitcase full of books? ), by all means slide that Kindle into your car, your purse, your bag, whatever. But if you aren’t saving money by using that e-reader, and if you aren’t saving space and effort, consider picking up a book that you’ll carry in your heart the rest of your life. We accumulate more and more things the older we get like snowballs expanding outward, comets becoming moons becoming planets (if I can mix metaphors). This, by itself, isn’t that unusual, but I’ve found that the objects that stick to me aren’t the objects most people surround themselves with. Others compile new phones, new TVs, new computers, new furniture, new and fancy cookware like food processors, and...well, you get the picture. But me, my house becomes more and more littered with books, comics, and graphic novels: my drug of choice. I suppose I’ve always known this, but recently I’ve had this habit thrust in my face. This past summer I moved in with my girlfriend--or rather we moved in together to a place new to the both of us. Her lease ended sooner, so she moved in earlier, leaving me plenty of time to pack, and more importantly, decide what I needed and what I could (or should) shed, like a snake crawling out of its old skin. The first round of purging was easy: I tossed old Halloween costumes into bags for Goodwill, letting memories of group costumes, college partying, and facepaint well up inside me until I squeezed them out, tossing them into the bags with the costumes that carried them. Next, on a similar track, I donated clothes that were too old, too big (ah, who am I kidding? Too small) and hardly worn. I took some more similar steps (getting rid of old DVDs, kitchen items I didn’t use, and so on) but finally I hit the first road block on my packing spree: the boxes, bookshelves, and floors full of comics, books and graphic novels. I didn’t think I could part with any of them, but I also knew that I couldn’t fit them into our new place, no matter how complex of Tetris-style moves I’d make. I started by going to Half Priced Books and selling individual issues and gifted books that had yet to be opened, convinced I could keep all my graphic novels and any book I’d read or wanted to read. But that only dropped a couple ounces and I was looking to shed pounds; I need to get more serious. It didn’t help that I’d drop off a box worth of issues and books and pick up a new graphic novel (on clearance! ), because it was almost as if it was free and still saving space: I always spent less than I earned through my sales and only carried out a book or two I could lightly hold in one hand, as opposed to the boxes I lugged around, possibly wrenching my back in the process. After getting rid of the obvious deadweight, I knew I needed to bail out more books and graphic novels if I was going to keep the new place afloat. This was much harder--it took me nearly two months to get rid of some books and reorganize my bookshelves, only to realize I could dump a few more and have to re-reorganize my bookshelves. I could keep belaboring the point, but I’ll save you my mental and emotional anguish (or maybe I’m saving myself the trouble of going over this again). I’m reminded of the advice given to new writers to murder their darlings. That’s what it felt like and I have no desire to relive that trauma. Ultimately, I was able to winnow my texts into a few bookcases worth, eyeing up the texts that truly meant something to me and said even more about me. One of my first exposures to comics, in the form of The Complete Calvin and Hobbes, perches at the top of a bookshelf, waiting to pounce on anyone who needs to feel like a kid again. And speaking of kids, beneath it lurks Little Lulu, a relatively new-to-me children’s classic that reminds us all how to make trouble when the rules and people around us are unfair. These comics mix with titles of heavier fare--the gorgeously illustrated vistas of Moebius’s Blueberry; the return to childhood fairy tales from a mature and maternal point-of-view as seen in Castle Waiting; the grittier than any James Bond movie, even the Daniel Craig ones, Queen and Country; the neo-noir that set me on my path to writing Rebirth of the Gangster, Azzarello and Risso’s modern masterpiece 100 Bullets; and many more. I could continue listing titles (I haven’t even touched on any of my favorite books like East of Eden, The House of the Spirits, and Invisible Man) but eventually we’d all crumble under their weight, much like my apartment used to sag from the sheer volume of paper and ink. Instead I’ll leave with this parting thought: although I at first raged against trimming my book-hoarding tendencies, I began to embrace it, feeling a new lease on life in the same way a dieter feels transformed after months of hard work. But--like that dieter--I find myself going back to old habits, adding a few ounces here and there, a new book shoved into a newly thinned bookshelf. I’m not back to the literary weight I used to be, but if I’m not careful, I’m going to need to go on a literary diet again, purging those pages I’ve consumed without thinking. I just made my third guest appearance on This Freakin' Show's podcast. It isn't up yet-we recorded last night and it takes a couple days for the guys to post it-but I'm really excited about it. They've been some of my biggest fans and supporters since day one, and it's always a pleasure to check back in with them. If you haven't checked out any of my previous podcast appearances, check out the link at the beginning of this post for their archives. In a few days' time, the new podcast with my third interview should pop up at the top of the archives. I think, much like the third issue that was just released, it's my best yet! All those first podcast jitters are gone, I know the hosts and their format better, and I've had practice with other podcasts, all of which lines up for a perfect interview. Check it out! And as always, if you have any quesitons, send me a line at cjstandal@gmail.com. We were in our early to mid-teens, and we were watching that great American classic, The Godfather. And whether I knew it or not, this movie would have a profound effect on me in the coming days, months and years. It’s not just that the movie walks a delicate tightrope between light and darkness, family and self-determination, sympathy and apathy, restraint and violence. And it’s not just that this was one of the few moments where my dad tossed his work obligations out of sight for a rare moment of bonding with his sons. No, it wasn’t any of those things that forged this into that nugget of gold shining in the murk of memory. What gave this movie its luster was that it sparked a desire that would never be satisfied, that could never find enough fuel for its flame: a desire that eventually launched me onto the path of writing Rebirth of the Gangster, my gangster greed so great that I wasn’t going to be satisfied until I was able navigate those dark waters myself. ...And speaking of looking back: that struggle between tradition and innovation--between loyalty and independence--is probably the biggest thread I pulled out of The Godfather when I was weaving the tapestry of Rebirth of the Gangster. In The Godfather, Michael Corleone returns home after trying to escape his family’s hold, and reluctantly grabs the reins of The Family, hoping to steer it into a new world of light instead of darkness, of legitimacy instead of lawlessness. This same struggle opens Rebirth of the Gangster and frames Marcus’s whole journey throughout the comic.